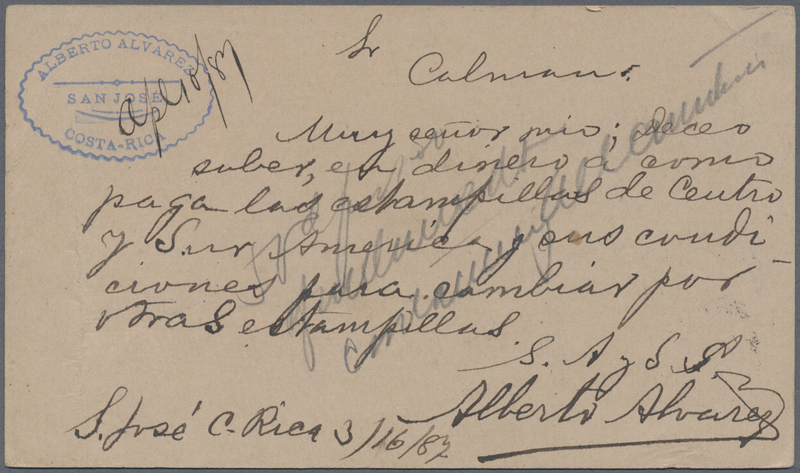 80080 Brief (cover) 88, 85, 78A 1908, "300 Years of Quebec" 7 C olive-green and 1 C blue + KGV 2 C on registered envelope sent from "HALIFAX DE 7 1908" to Colmberg, Germany with b/s arrival 18.12.08, the 7 C is rare on letter! 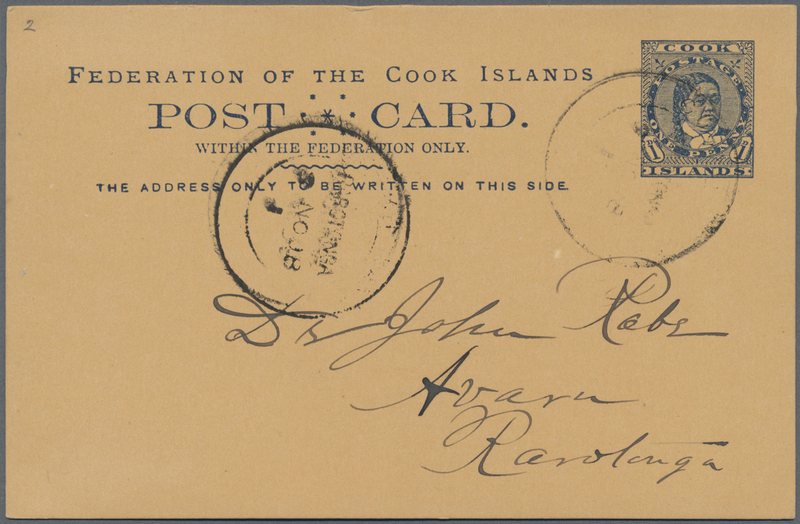 80081 Ganzsache (Complete) H&G 2 1894, Stationery card Queen Makea Takau 1 d. blue on ocre very fine used to Avara, Ravotonga. 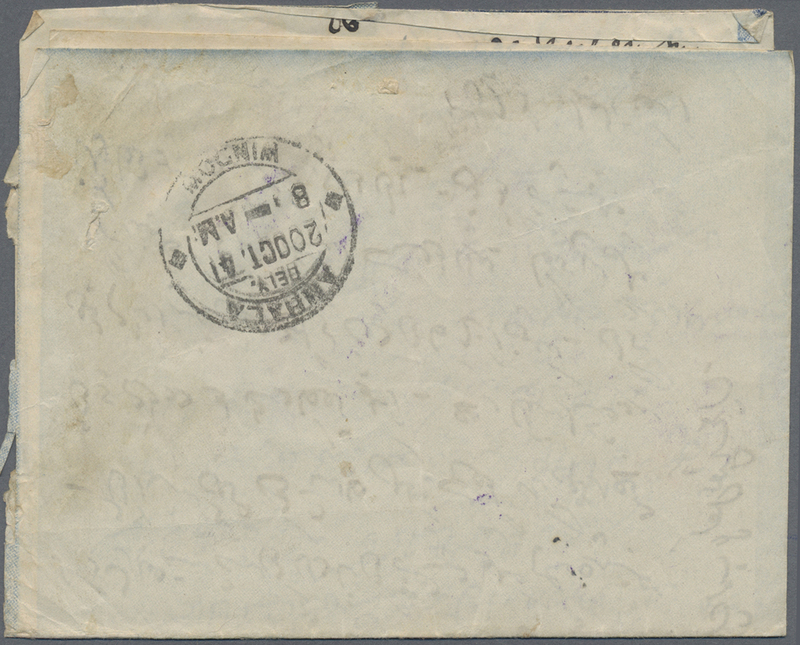 80083 Brief (cover) Yv. 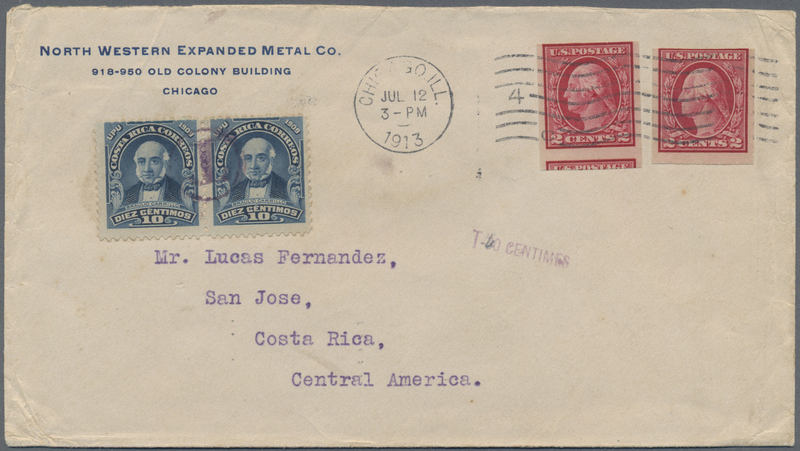 69(2) + USA SG 4 1913, USA 2x 2 C carmine on envelope sent from "CHICAGO JUL 12 1913" sent via New Orleans to Costa Rica, where a pair of 10 C blue was afiixed and tied by violet due-cds "T" + beneath handsstamped "T-40 CENTIMES"
80084 Ganzsache (Complete) 1953, International Reply Coupon 30 Centimaos with cancel "COSTA RICA DIC 9 1953"
80087 Ganzsache (Complete) 1945, uprated airmail postcard from "BRAZZAVILLE 15 MR 45" to Red Cross in Geneva. 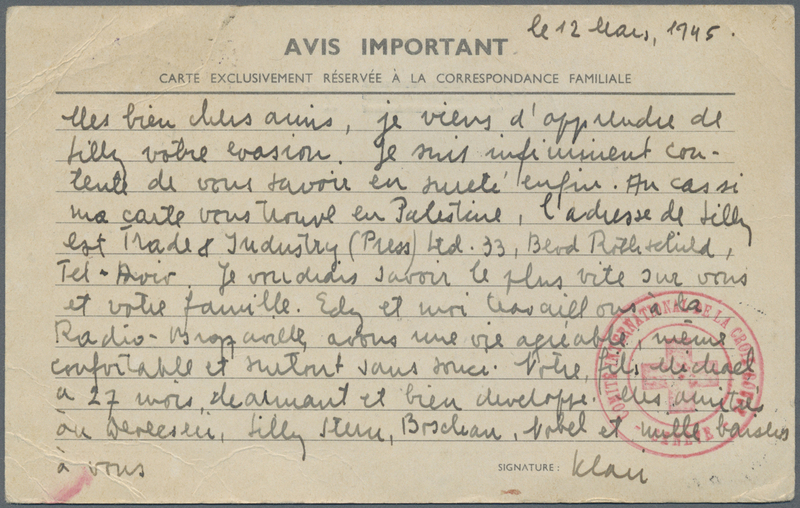 Text about emigration to Palestine. 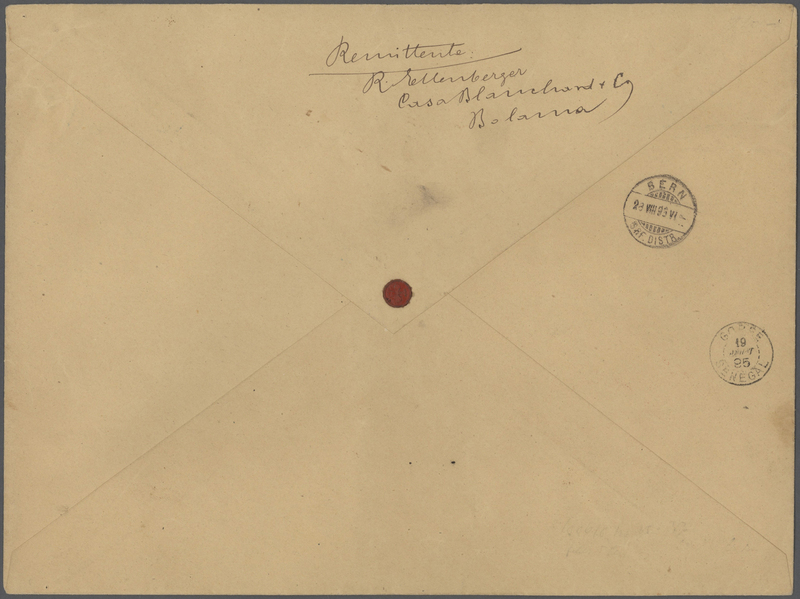 With Censor markings. 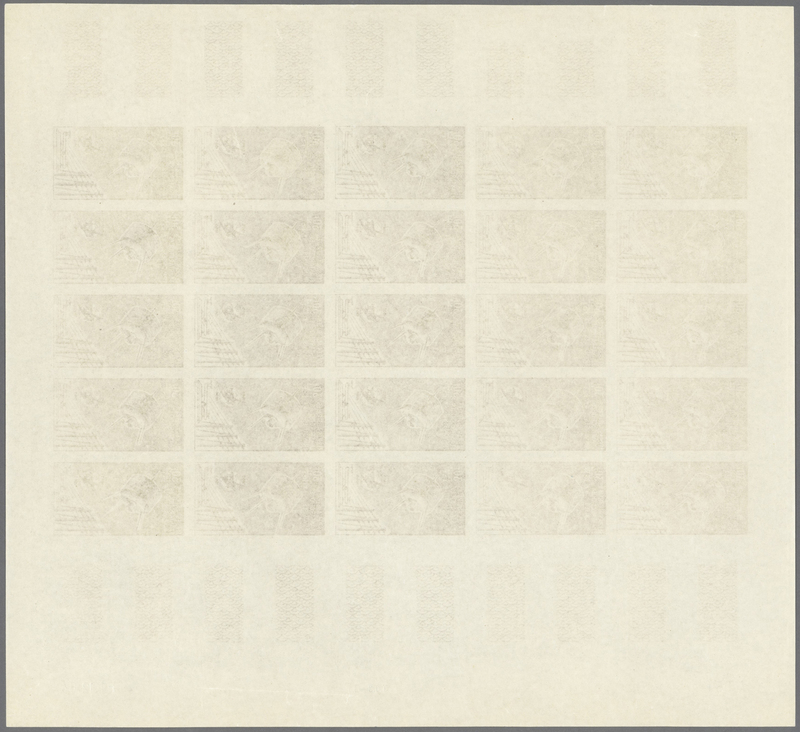 80088 ungebraucht ohne Gummi (unused without gum) (*) 8 - 9 epr. 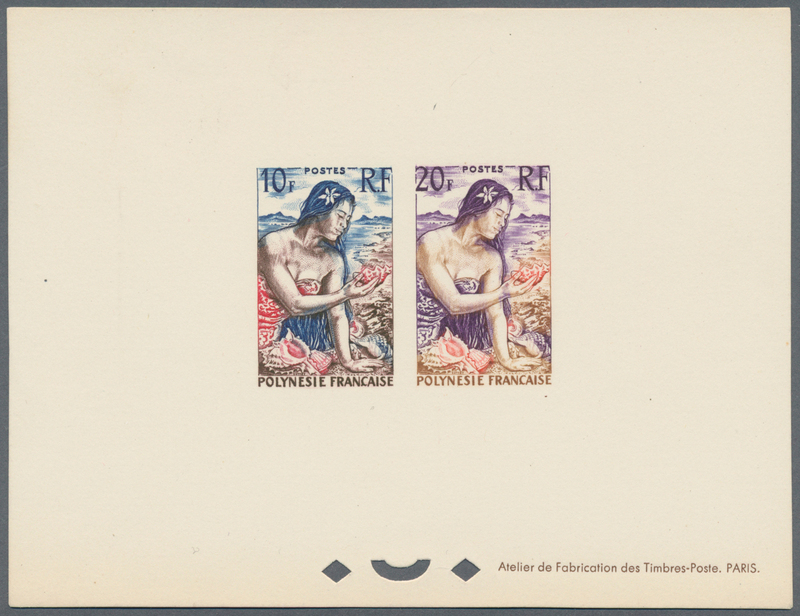 1958, postage stamps: Shell collector 10 Fr and 20 Fr as Èpreuve collective. 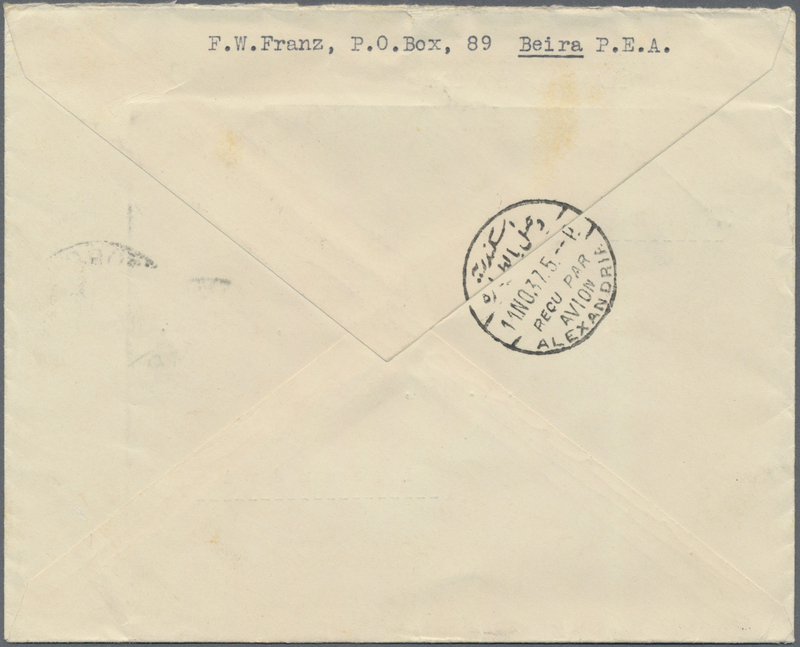 80090 Brief (cover) 1932. 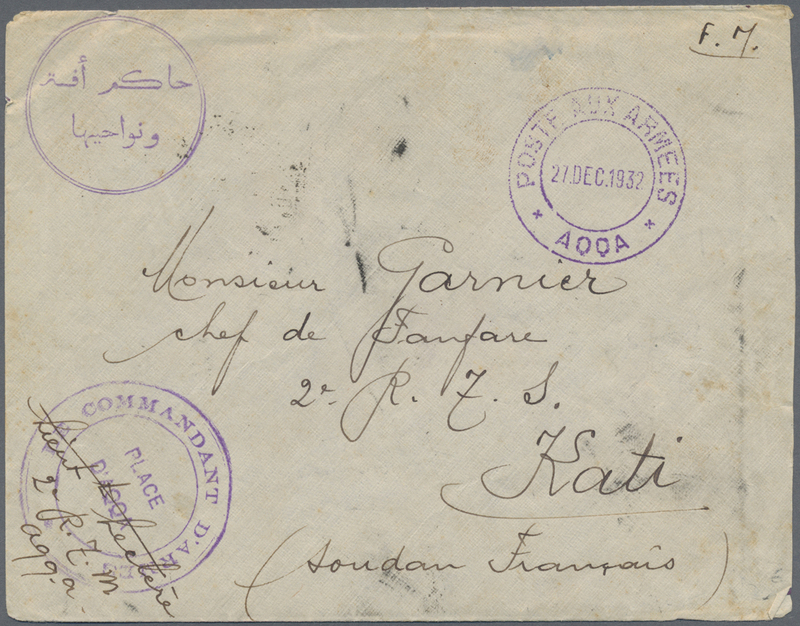 Stamp-less military mail envelope written from the '2nd Regiment, Aqqa', addressed to French Soudan cancelled by 'Poste Aux Armees/Aqqa' double ring '27/12' with military cachet 'Le Commandant D’Armees/Place D’Aqqa' in violet and circular Arabic cachet, routed via Agadir/Maroc 'I/I' with Tresor et Postes transit and Kati/Soudan Francaise arrival '23/1/33' on reverse. 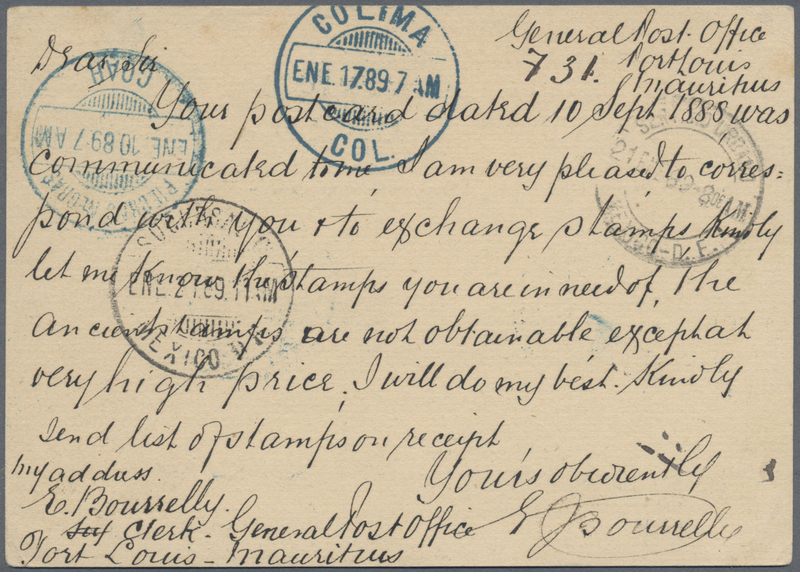 Lovely item of destination mail. 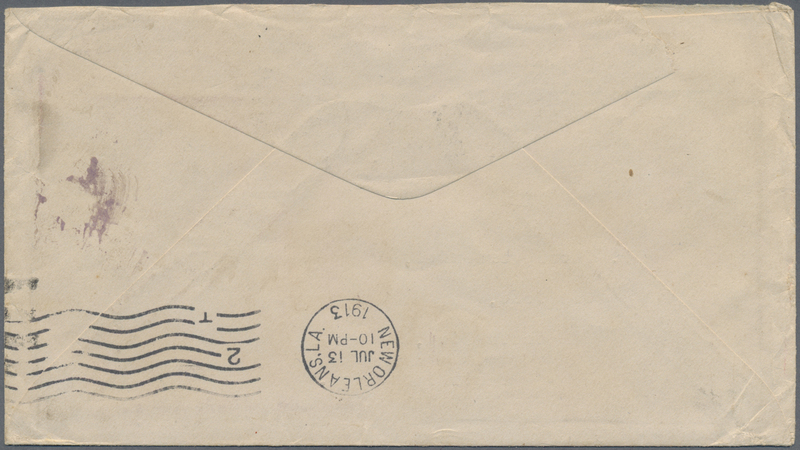 80091 Brief (cover) 1941. 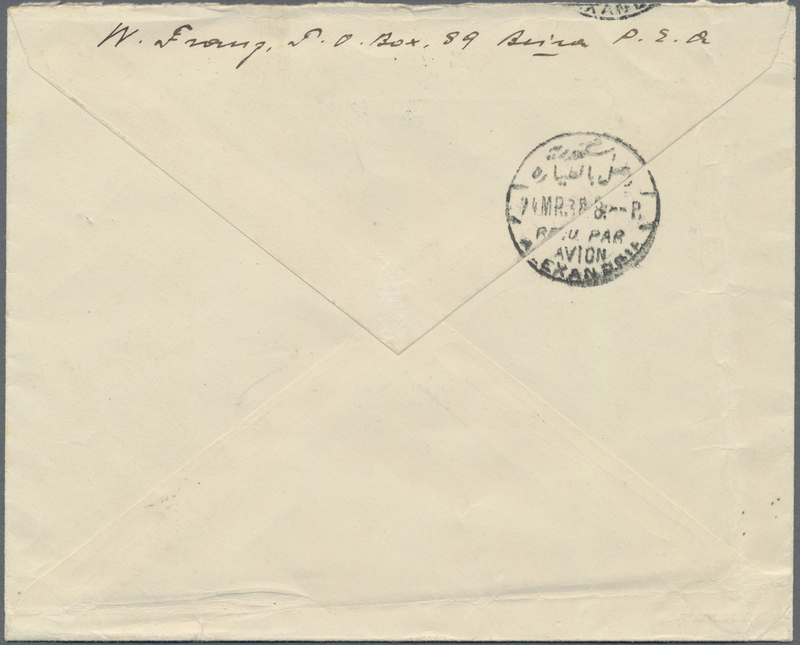 Air Mail letter card written from 'Indian Forces in Sudan' addressed to India bearing India SG 250, 1a carmine and SG 251, 2a vermilion tied by Field Post Office / No R2' date stamp '10th Oct 41' with triangular 'Passed by Censor/No 2970' in violet on face and Amhala arrival on reverse '20th Oct'. 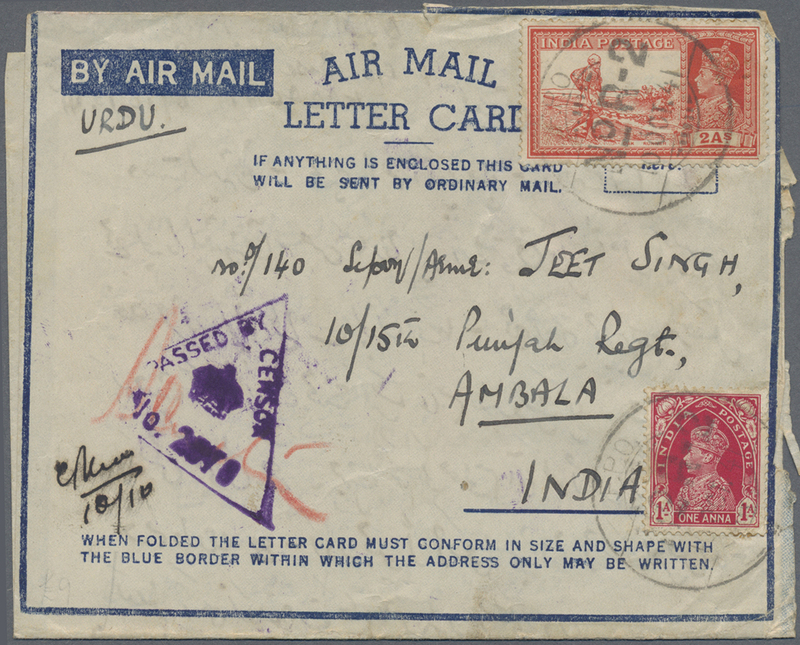 Lovely item of mail from the Indian Field Post Office in Sudan. 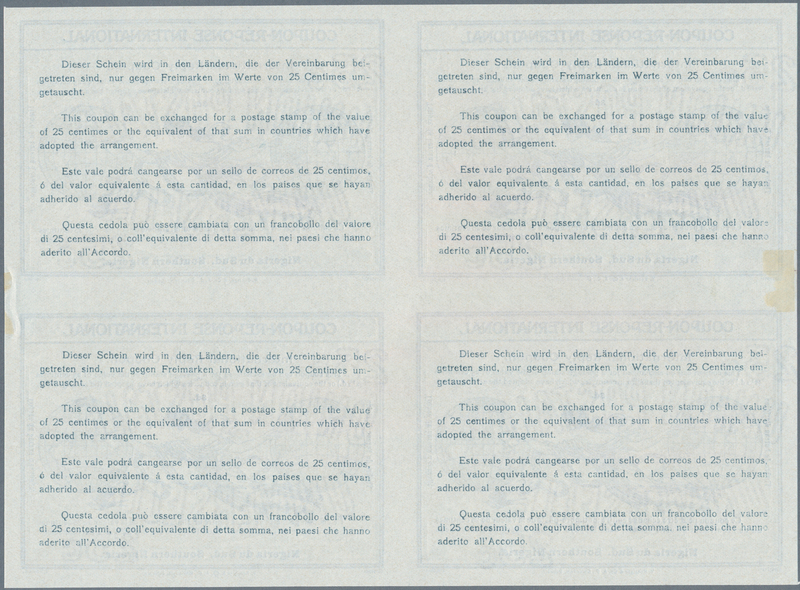 80092 ungebraucht ohne Gummi (unused without gum) (*) 1965. 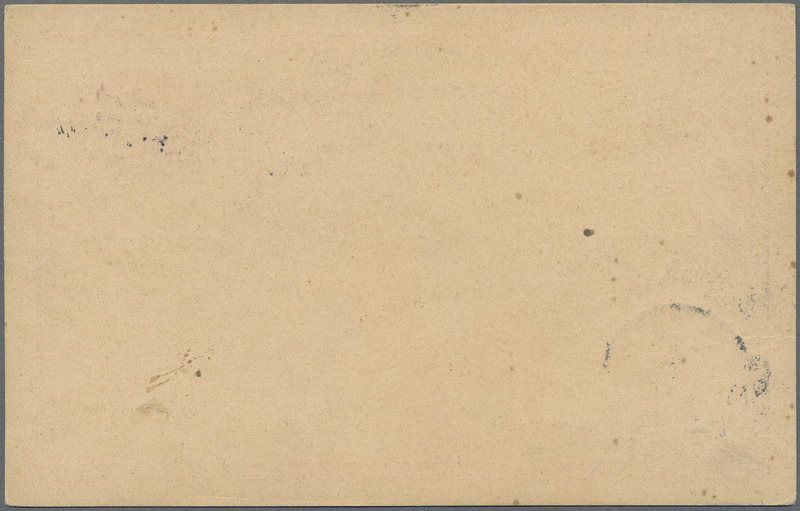 Complete sheet of 25 essays including 8 multicoloured. 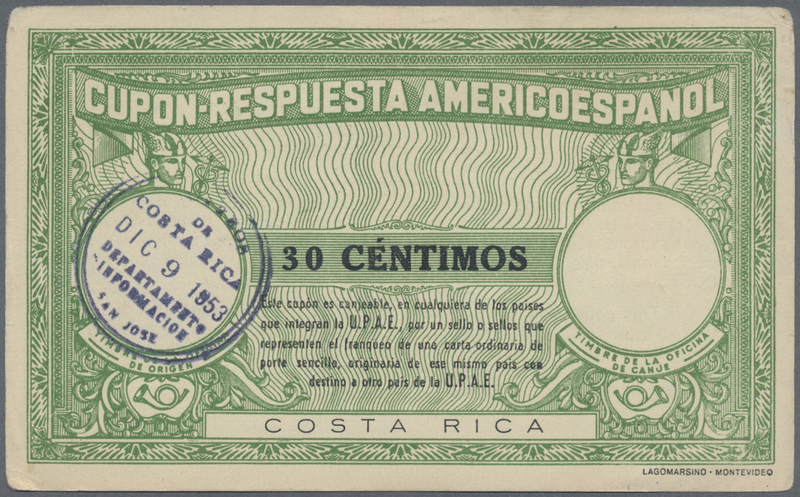 ÷ 1965. 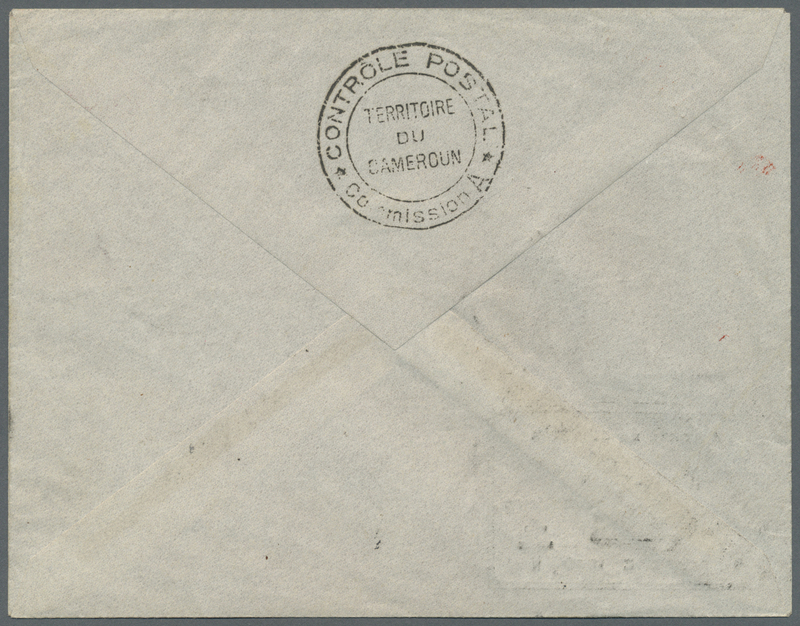 Feuille entière de 25 essais dont 8 polychromes, CD 1.12.64. 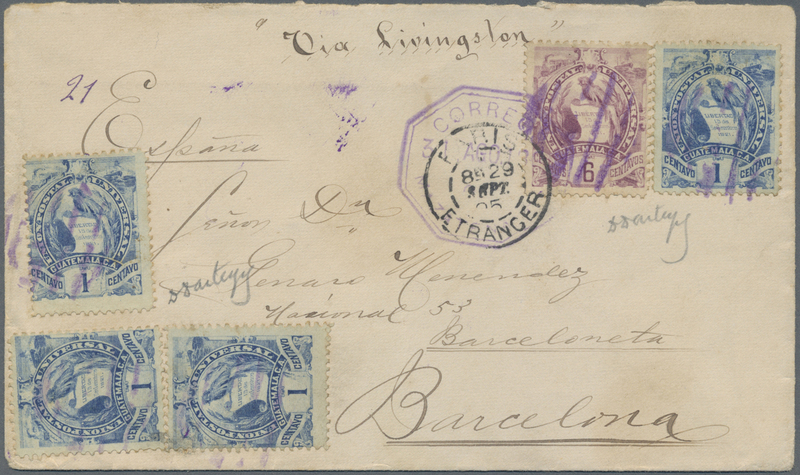 80093 Brief (cover) 43 (4), 46 1895, cover franked with 1 C (4) and 6 C. coat of arms form MAZATENO 31.8.95 via Guatemala Capital, Paris to Barcelona, Spain. Expertised. 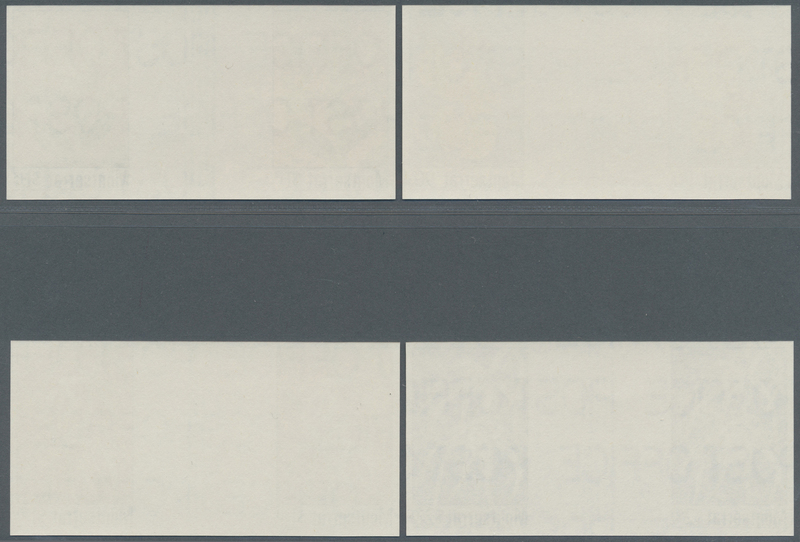 80094 1949/1950. 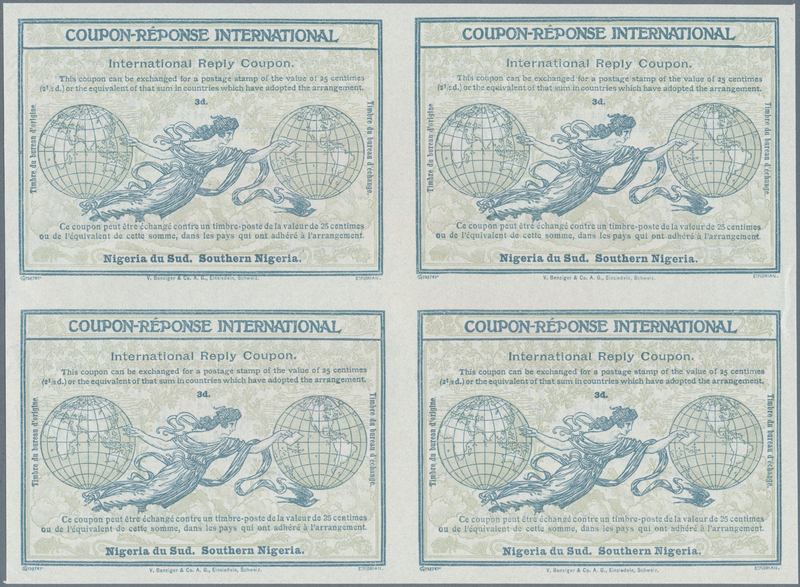 Type not issued engraved by "American Bank Note". (There are only 3 series). 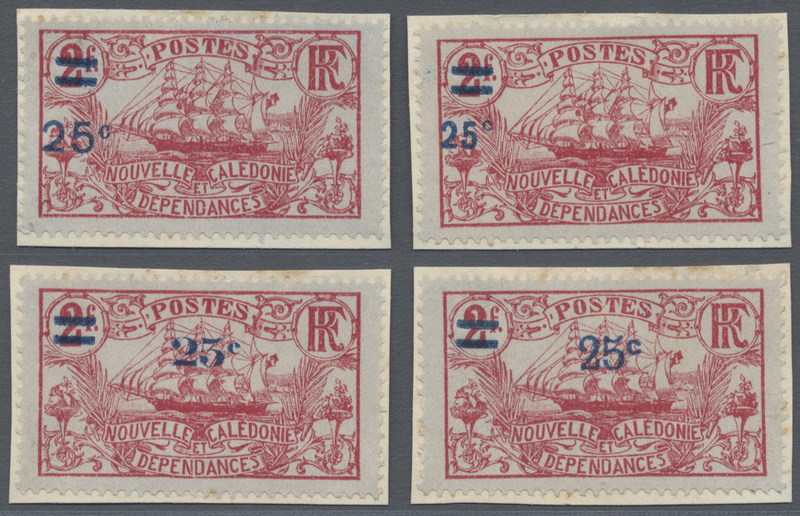 Complete series of the 7 numbered prooves: 75° an UPU. 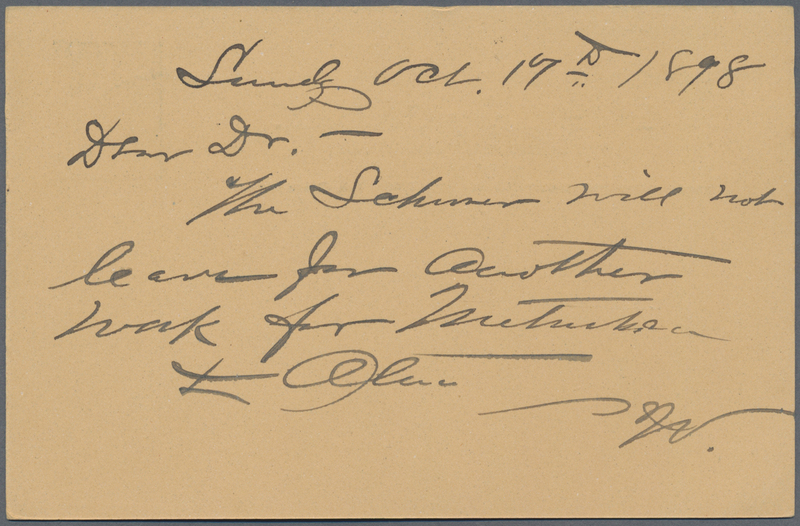 Great rarity. 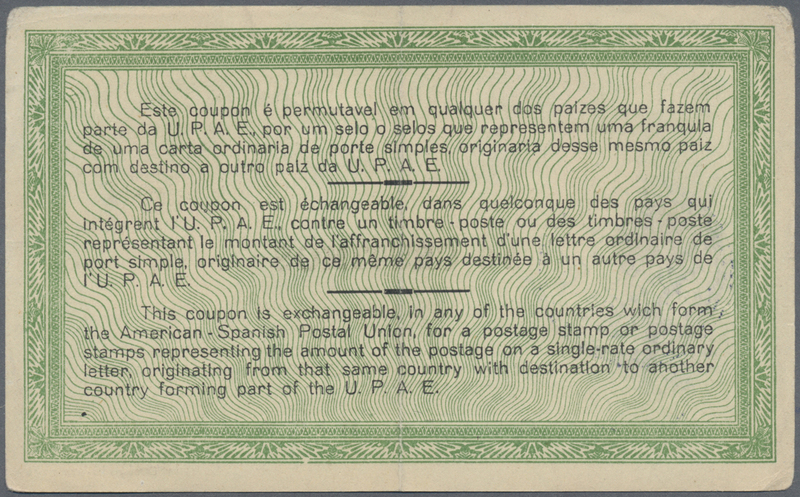 ÷ 1949/1950. 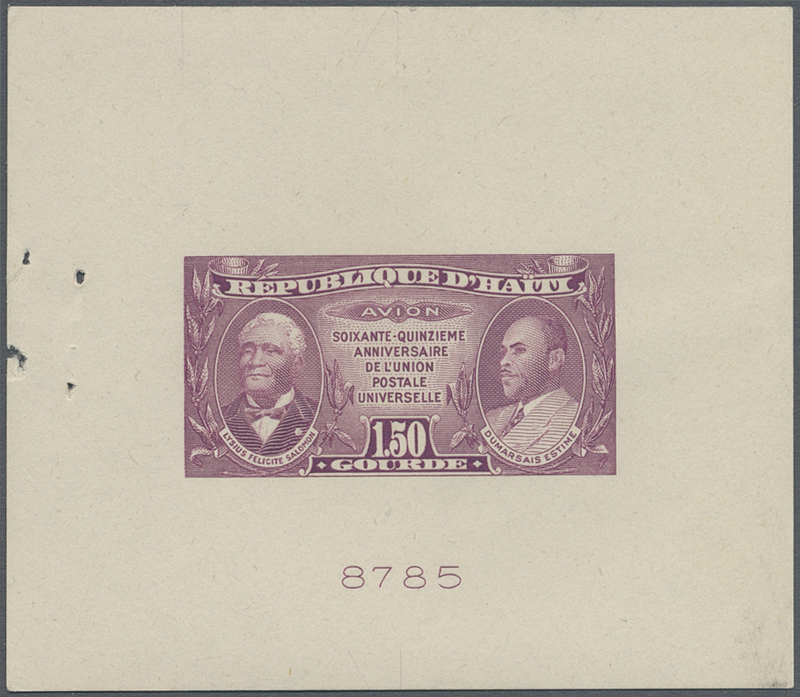 Type non émis gravés par "American Bank Note". (Il n'existe que 3 séries). 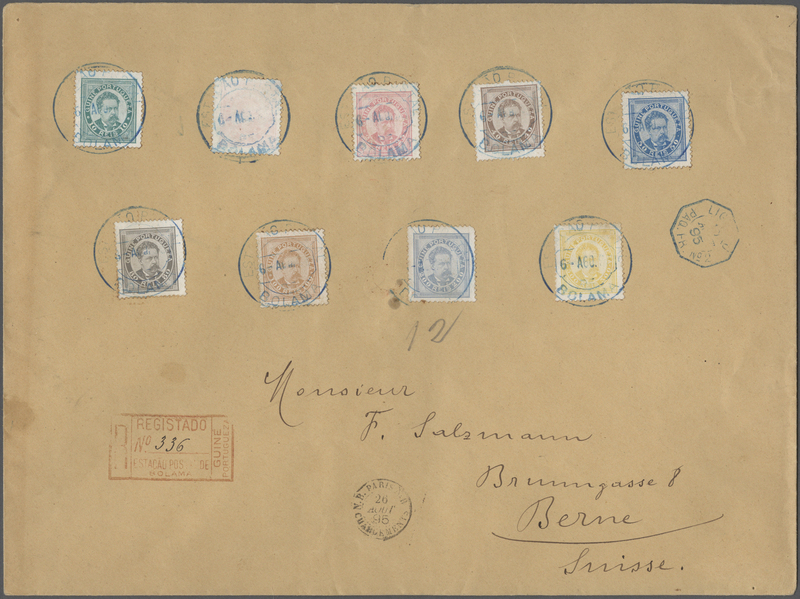 Serie complète des 7 èpreuves numérotées: 75° an UPU. 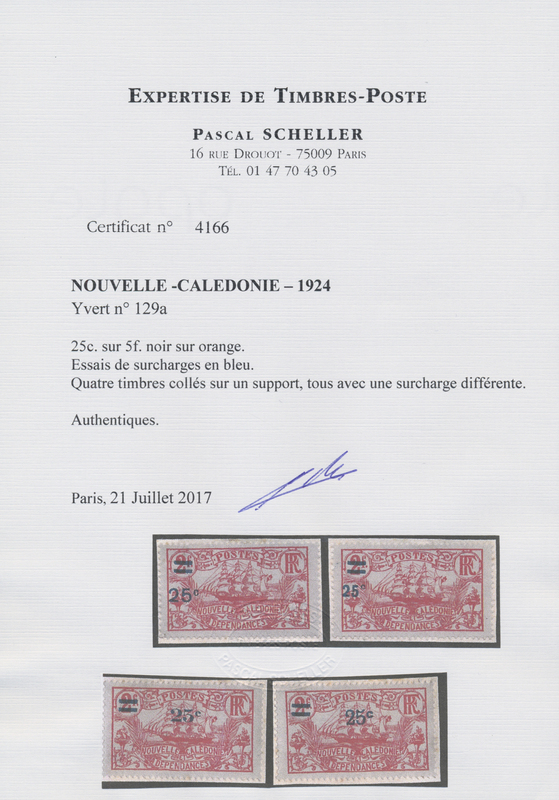 Grande raretè du thème. 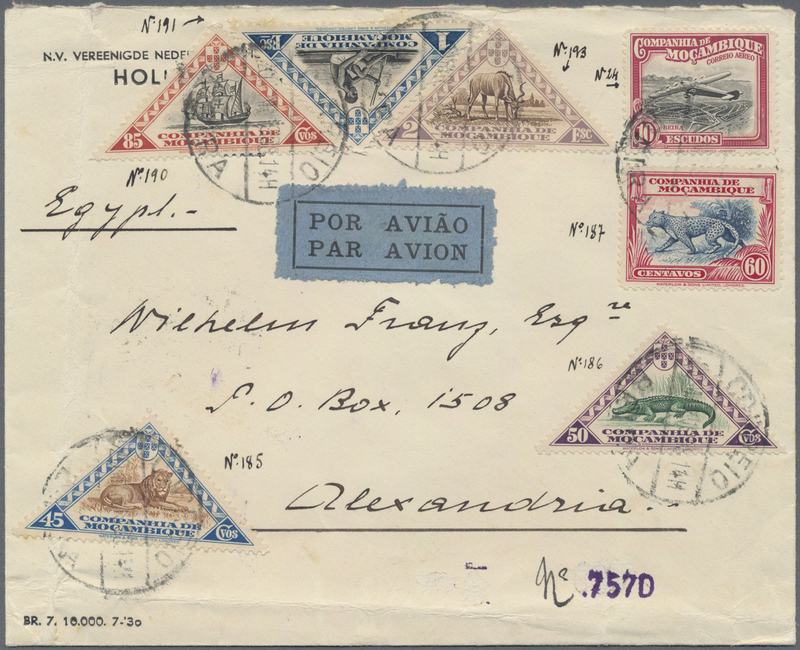 80096 Brief (cover) 1932 registered cover from Tripoli to Recife via Friedrichshafen, 5th Zeppelin-flight to South America (5. 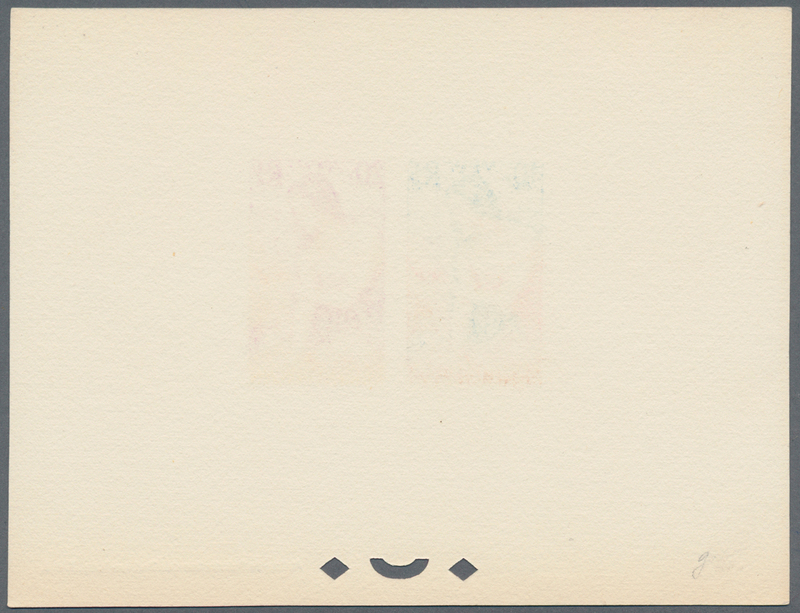 Südamerikafahrt 1932). 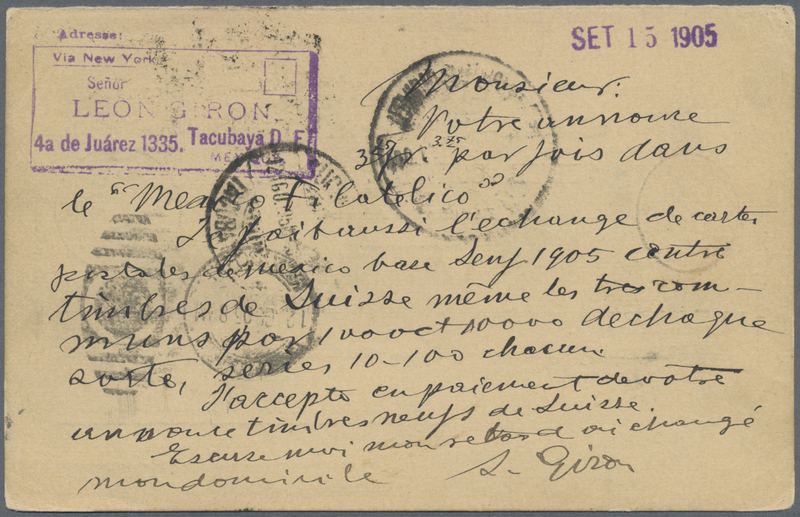 80099 Ganzsache (Complete) 54 I 1900, 3 C (13 pearls over inscription) on coloured picture card sent from "MONROVIA 25 SEP 01" via Las Palmas and Funchal to Madeira. 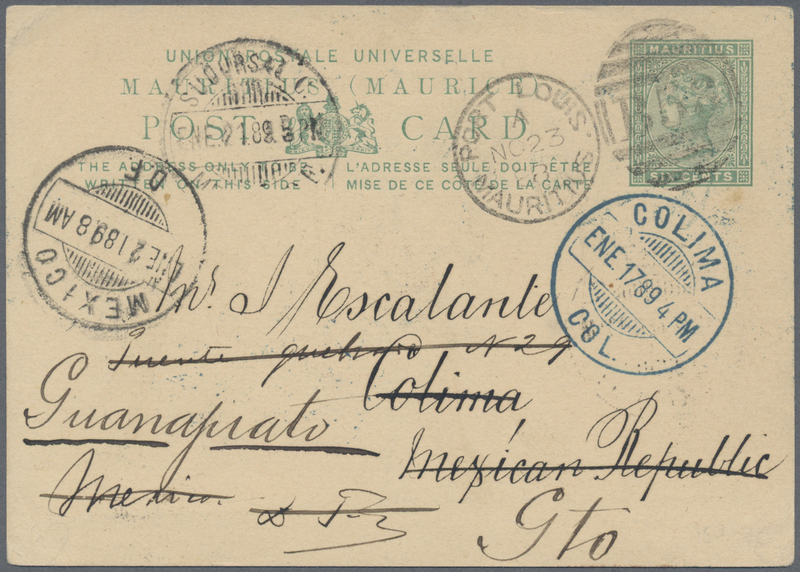 80102 Ganzsache (Complete) Ascher 3 1889, 6 d stationery card with duplex "PORT LOUIS/B 52" sent to Colina, Mexico, redirected to Guanapiato and back to Mexico City. Rare destination. 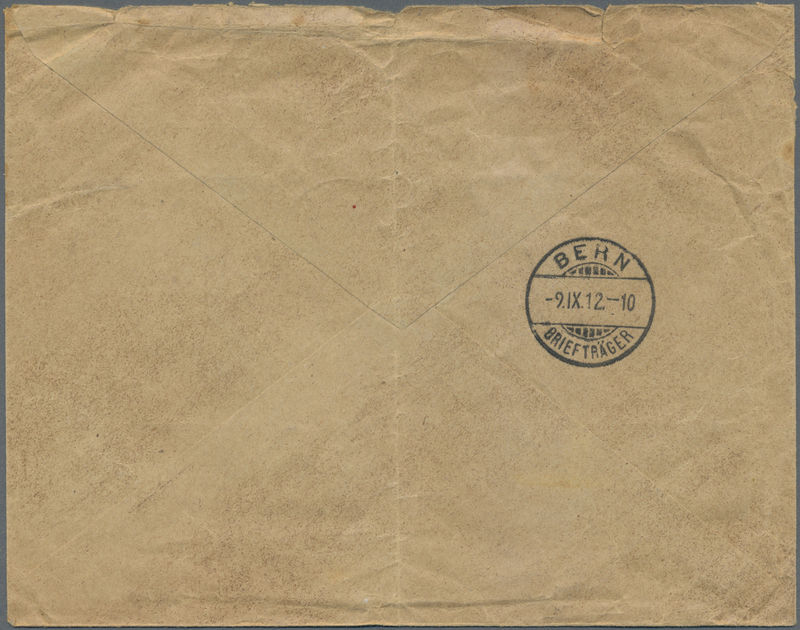 80103 gestempelt (marked) ungebraucht (hinged) * 1938 King George VI 4c green mint plus a fine used copy showing the ‘open C’ (SG No 254a) and 1938 10 rupees fine used. 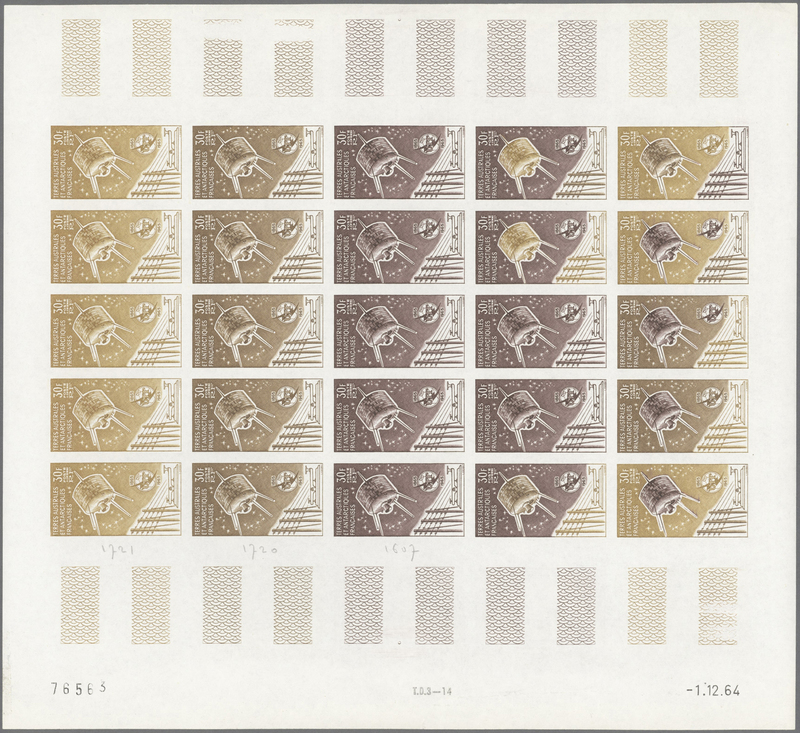 80104 Ganzsache (Complete) 23 1905, 2 C. stamp on 10 Rp. 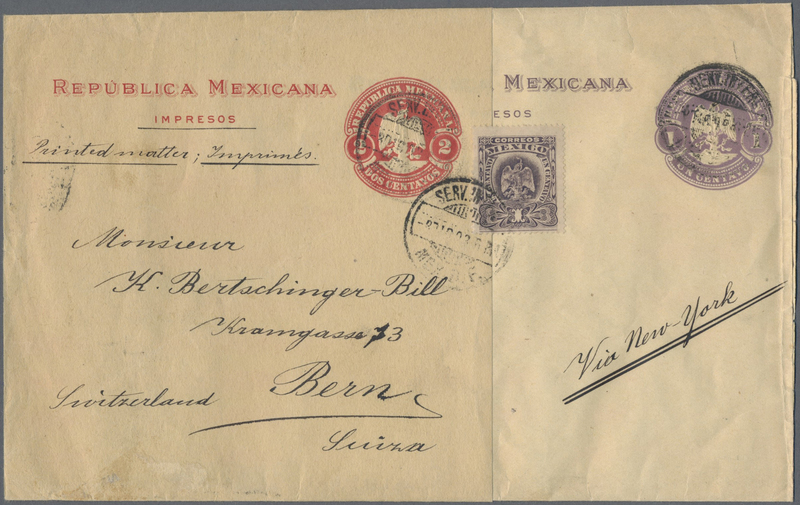 Swiss reply postcard with duplex "SUCURSAL MEXICO D.F. 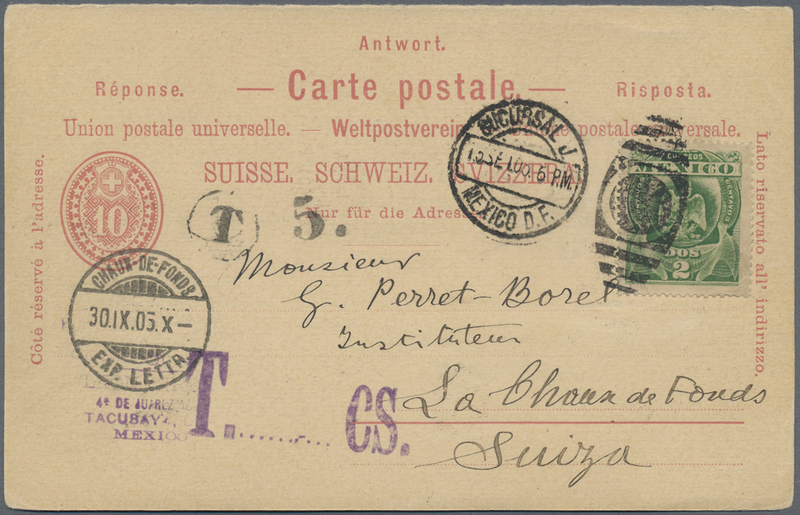 15-9-05" back to Switserland with several tax markings. 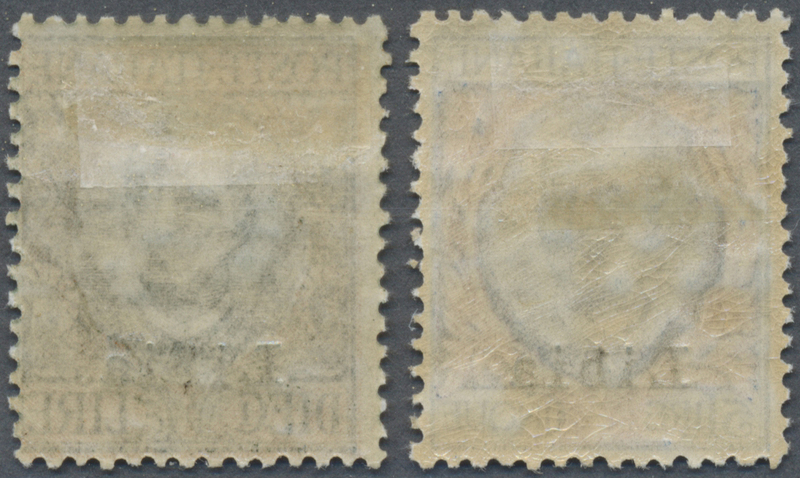 80105 Ganzsache (Complete) Ascher 31,31, 236 1908, 1 and 2 C. wrapper fixed together and uprated by a 1 C, stamp. 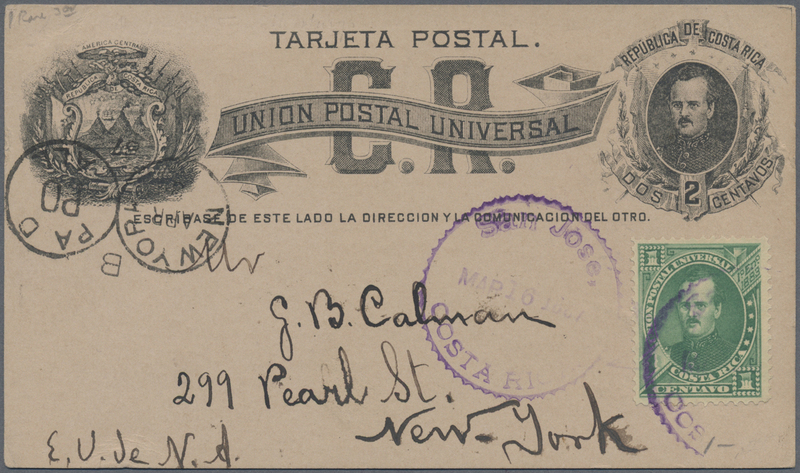 This sent a heavy printed matter via New York to Switzerland. 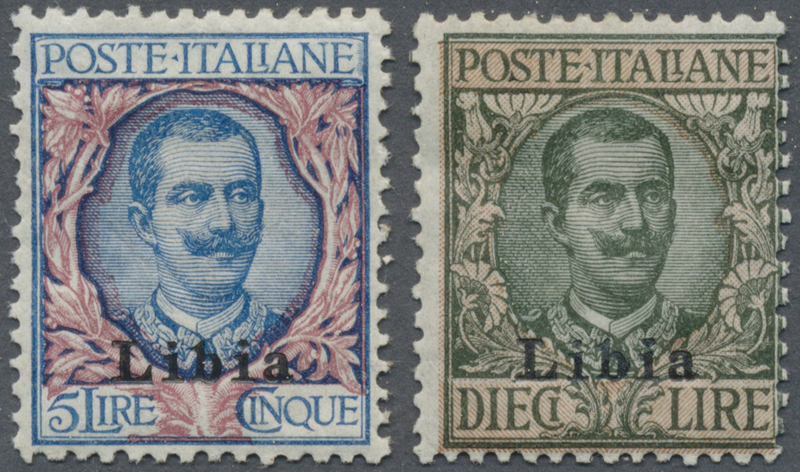 Rare and very unusual. 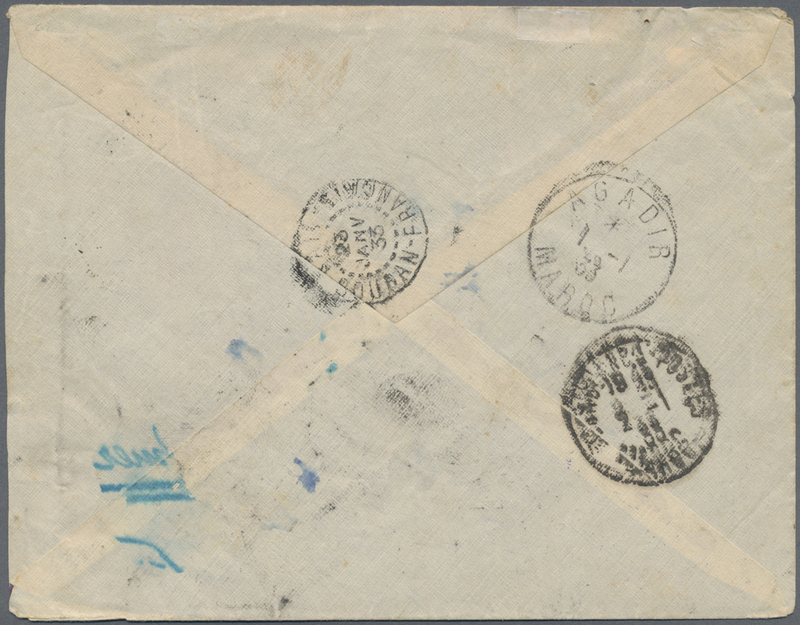 80106 Brief (cover) 199, 218 et al. 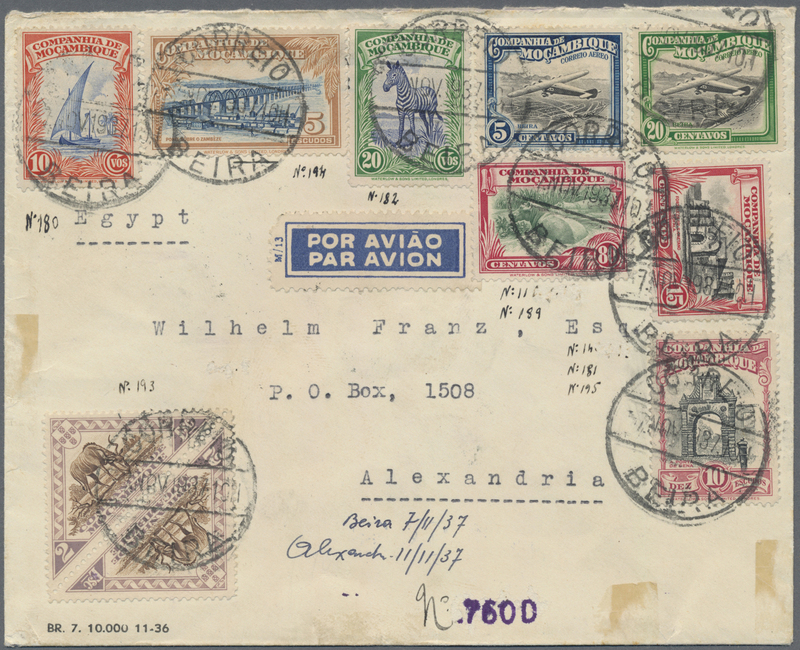 1937, Two airmail covers from Beira to Alexandria, Egypt franked by total 17 stamps of 1935 Air issue up to 10e. 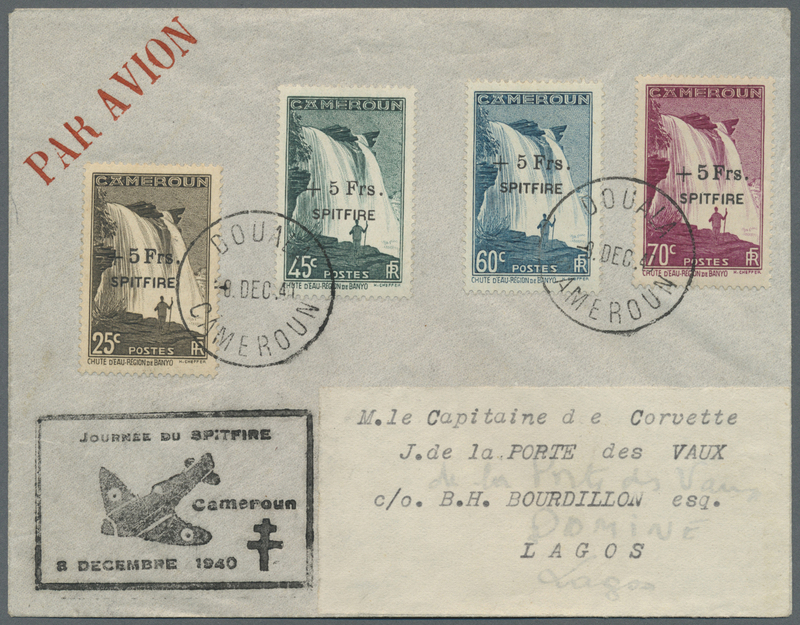 and 1937 'Landscape' up to 10e., all tied by Beira cds and with arrival cds on back of each cover, minor imperfections but still good and attractive. 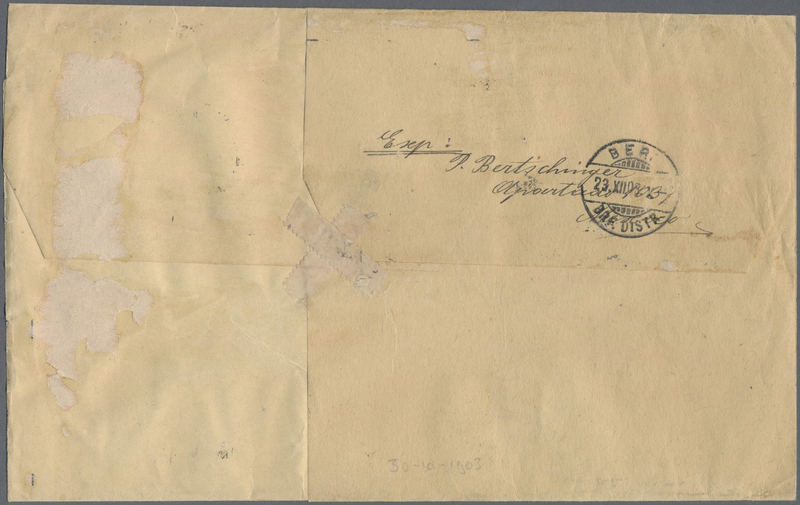 80107 Brief (cover) 26 (2), 29 (2) 1916, censored cover franked with 1/2 C (2) and 2 C (2) together with war benefitsstamp to Zürich, Switzerland. 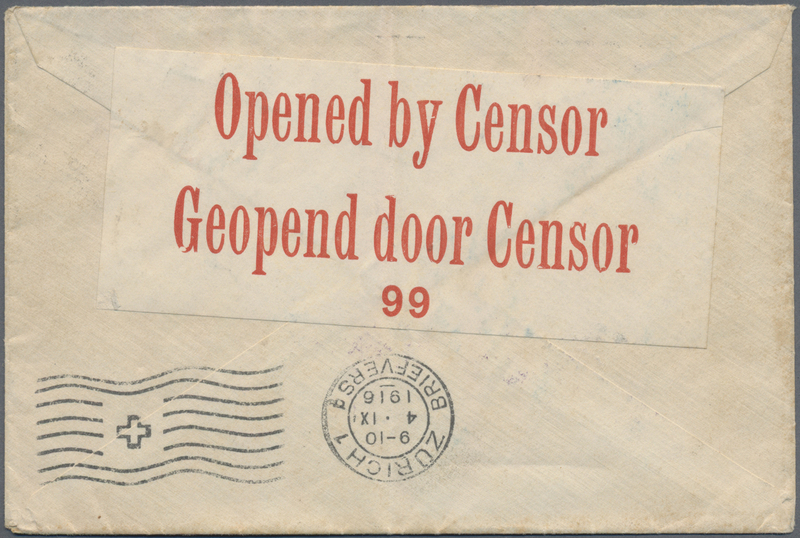 Censor marks with " PASSED CENSOR" single line, boxed "PASSOS PELOS CENSOR QUELIMANE" as well as red South African censor label "Opened by Censor/Geopend door Censor/99" on reverse. 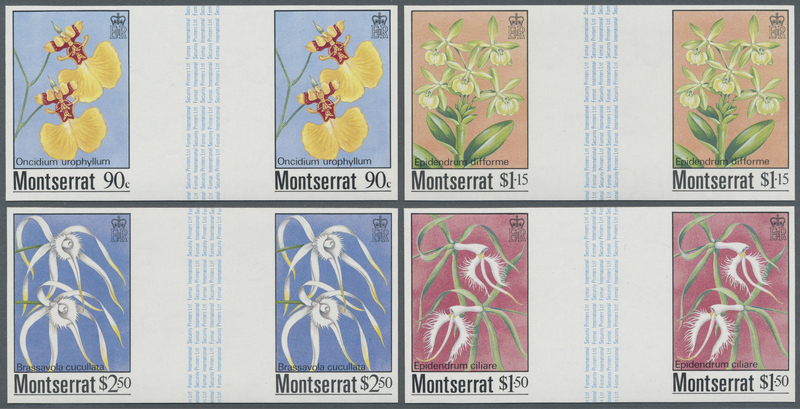 80108 postfrisch (never hinged) ** 658/71 UZW 1985, Orchidaceae, 4 values complete in imperforated horizontal gutter pairs, unmounted mint. 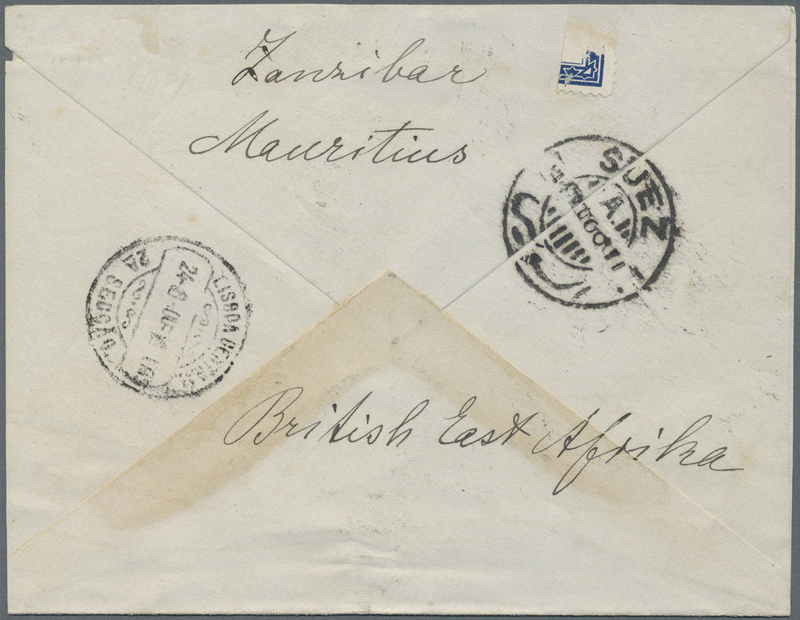 80112 Brief (cover) 1864, Small stampless envelope with 3-line cancdel "PANAMA JA 22 1864 TRANSIT" and due-cancel "GB // 2F875/10 C" sent via London, Calais and Paris to Coutanges, France with b/s three transits and arrival 15.2.64. 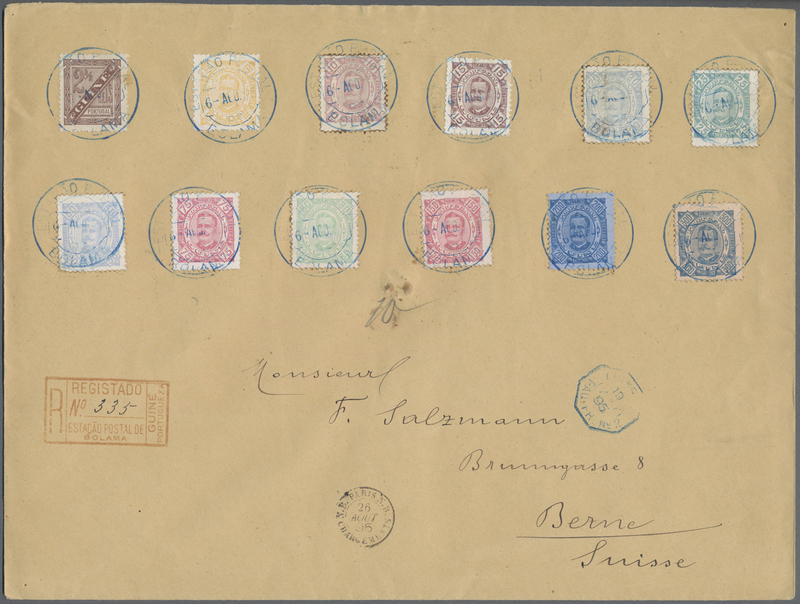 80113 Brief (cover) 16/24 1895, large registered cover 10 to 300 Reis (5 R. missing) 1886 King Louis I issue sent from BOLAMA 6.8.95 via Goree (Senegal) and French shipmail, Paris to Bern, Switzerland. 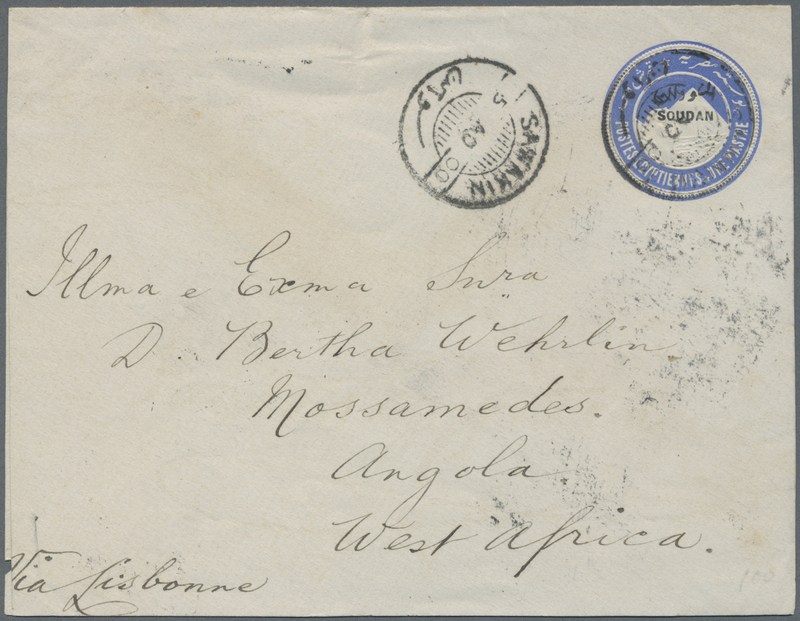 80114 Brief (cover) 25/37 1895, large registered cover bearing 2 1/2 R. numeral and 5 to 300 Reis (100 R. missing) 1894 King Carlos I issue sent from BOLAMA 6.8.95 via Goree (Senegal) and French shipmail, Paris to Bern, Switzerland. 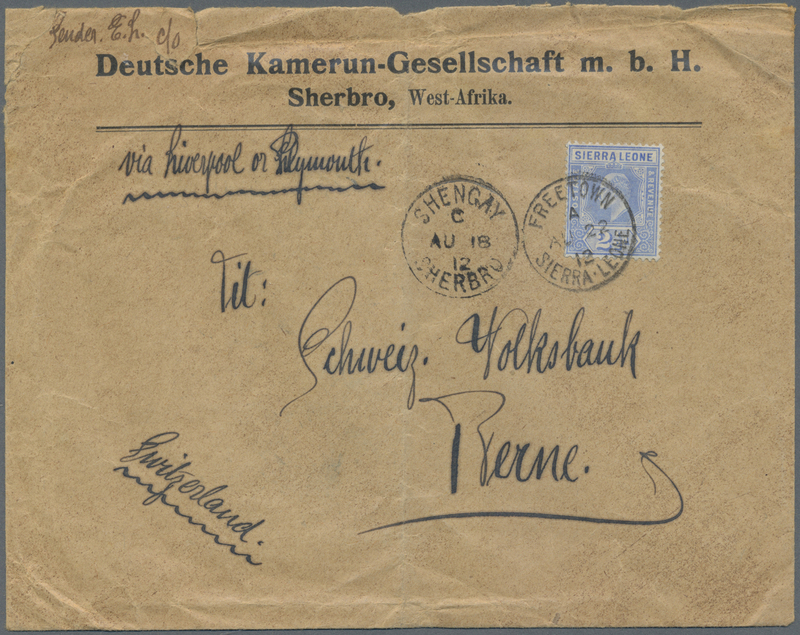 80115 Brief (cover) SG 103 1912, originally unstamped letter from "SHENGAY-SHERBRO AU 16 12" with sender´s imprint "Deutsche Kamerun-Gesellschaft, Sherbro" via "FREETOWN AU 22 12", there franked with 2 1/2 d KE VII "via Liverpool or Plymouth" to Berne. 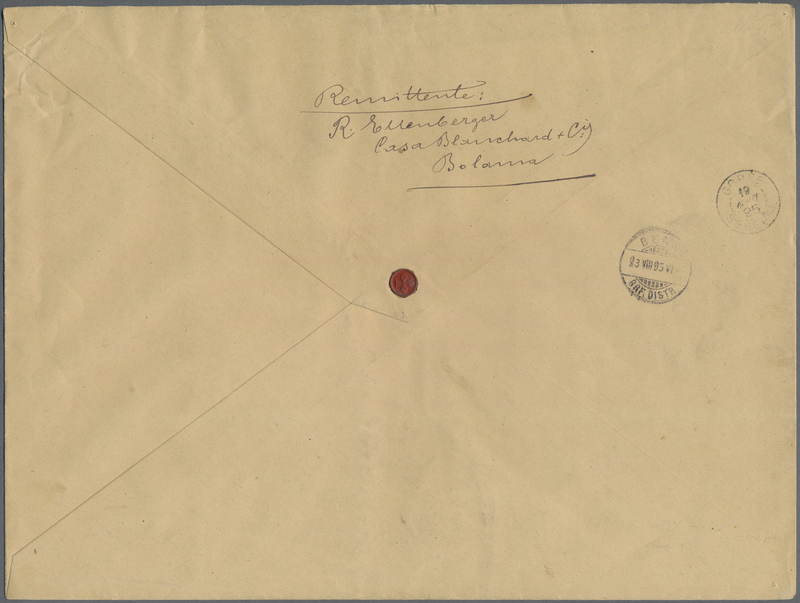 80116 Ganzsache (Complete) 1900. 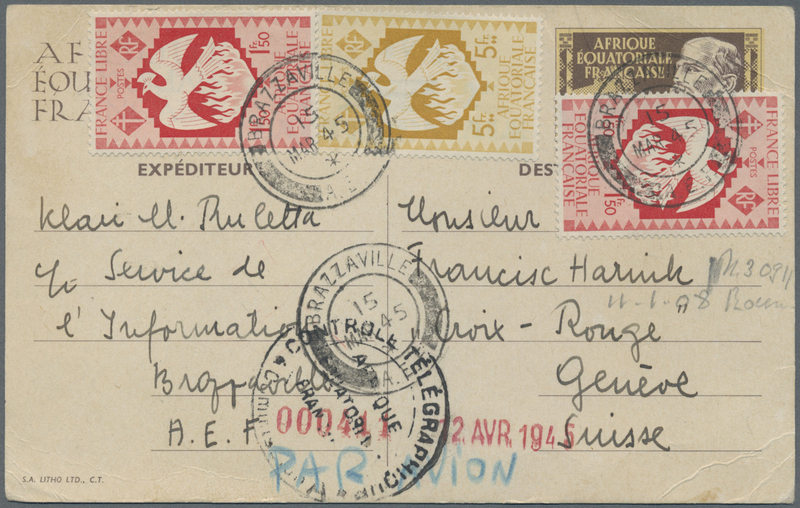 Sudan postal stationery envelope 'One Piastre' blue cancelled by Sawakin date stamp '5th Ao 00' addressed to Mossamedes, Angola, West Africa endorsed 'via Lisbonne, Zanzibar, Mauritius and British East Africa with Suez and Lisboa '24th Aug' transit on reverse. 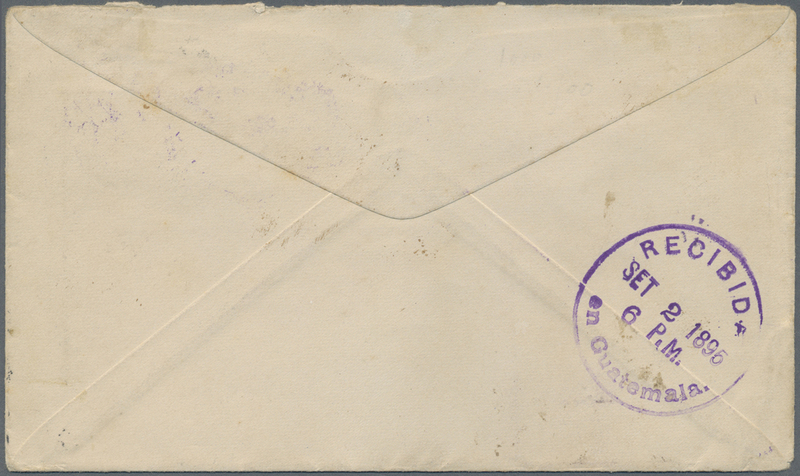 Lovely item of destination mail. 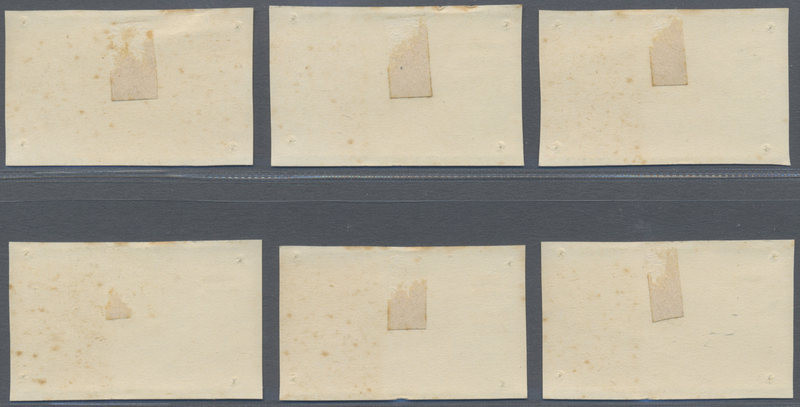 80117 Ganzsache (Complete) H&G 4 var. 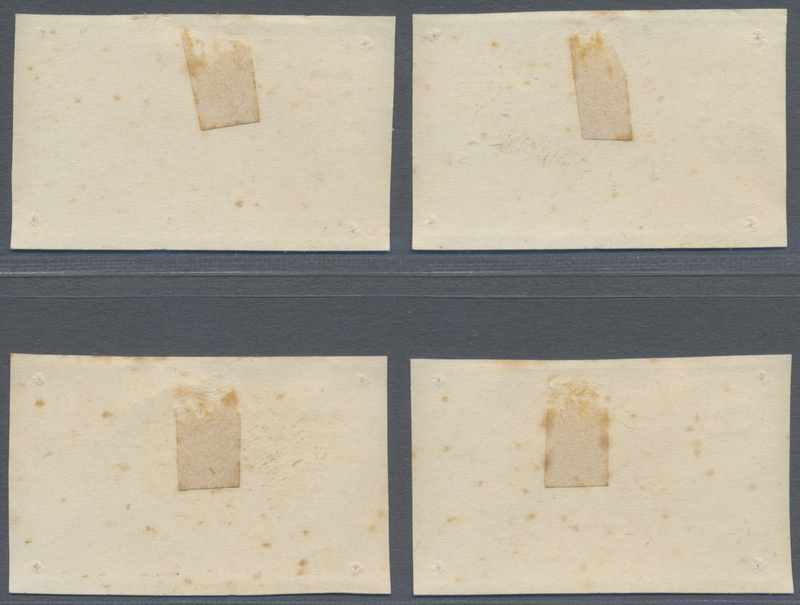 1899, DOUBLE IMPRINT "4 Milliemes" on 5 M stationery card mint, this card with double imprint is unknown in H&G-catalogue. 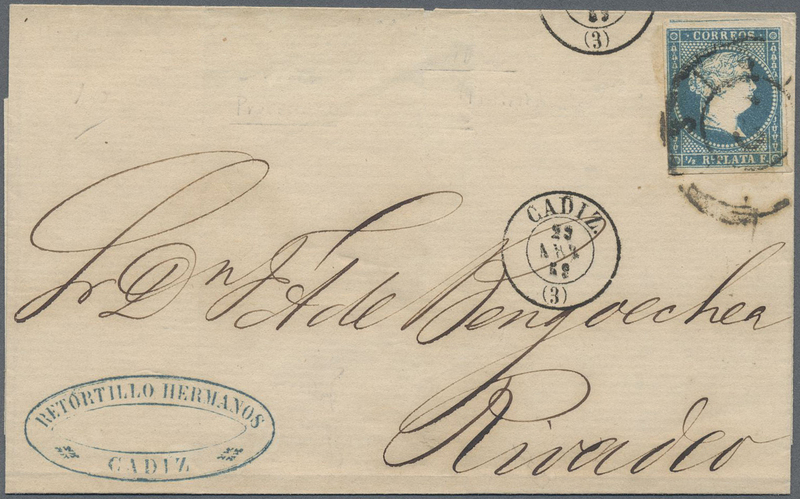 80118 Ganzsache (Complete) H&G 4 Var., 1899 Postal stationery card 4m. 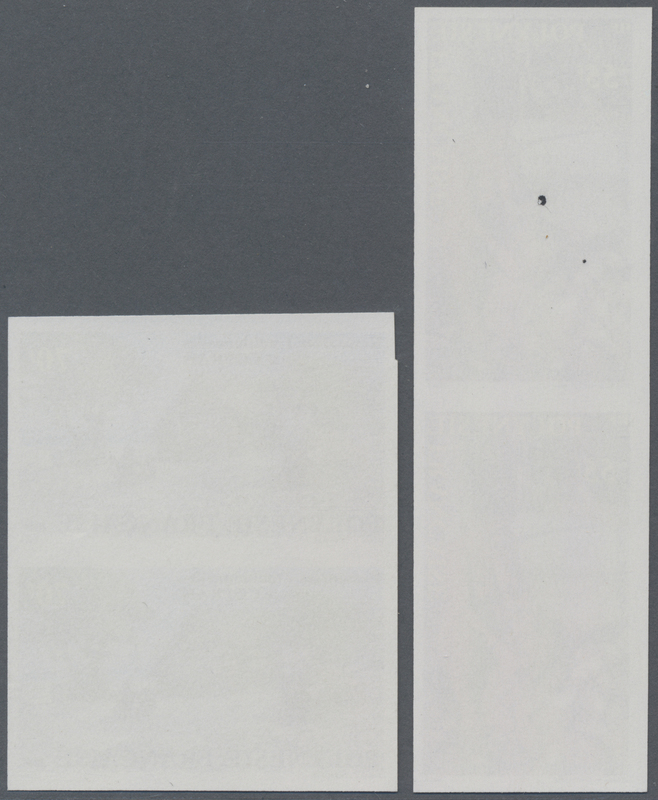 on 5m. 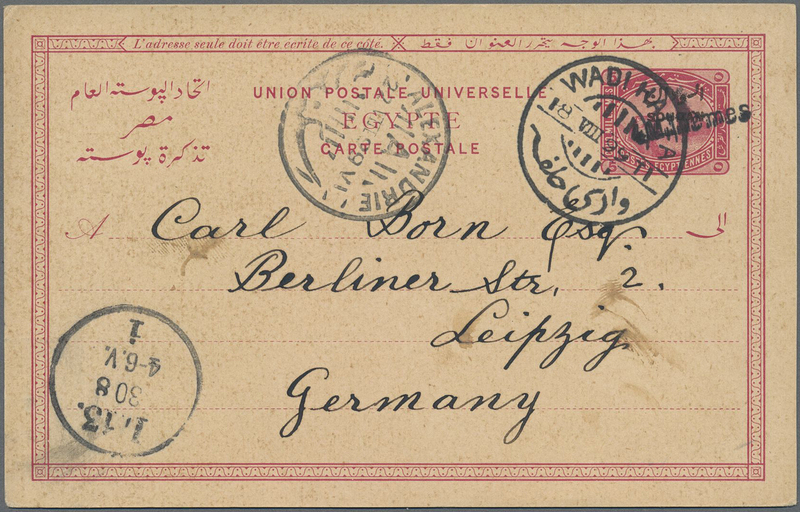 carmine, variety DOUBLE SURCHARGE "4 Milliemes" (partially), used from Wadi Halfa to Germany, cancelled by "WADI HALFA/18 VIII 99" cds, with Alexandria '22.VIII.99" transit cds and Leipzig '30.8. 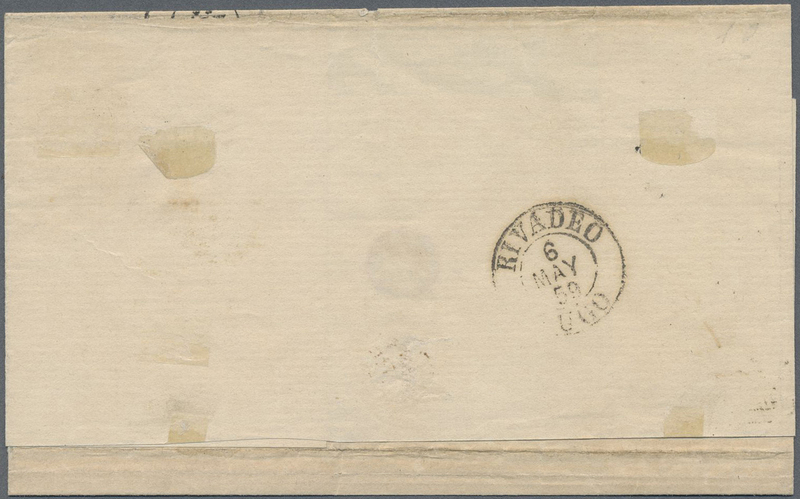 (99)' arrival cds, fine and scarce. 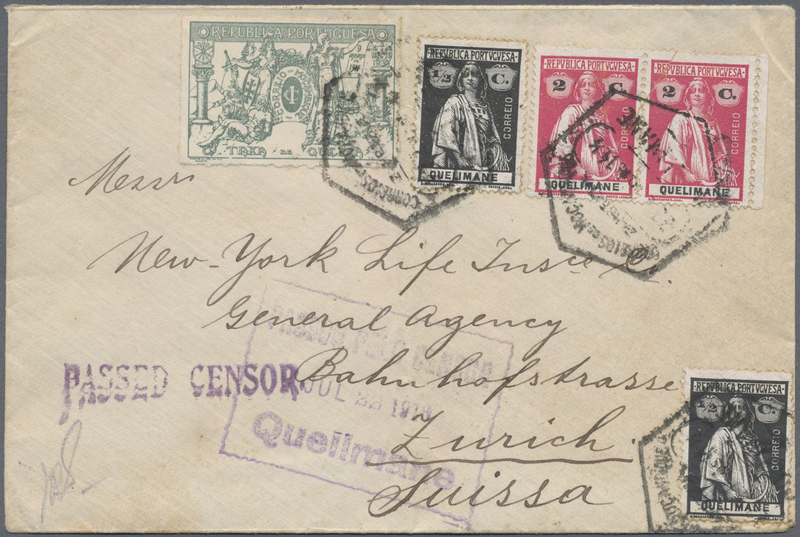 80119 Ganzsache (Complete) 1911. International Reply Coupon 3d (Rom type) in an unused block of 4. Luxury quality. 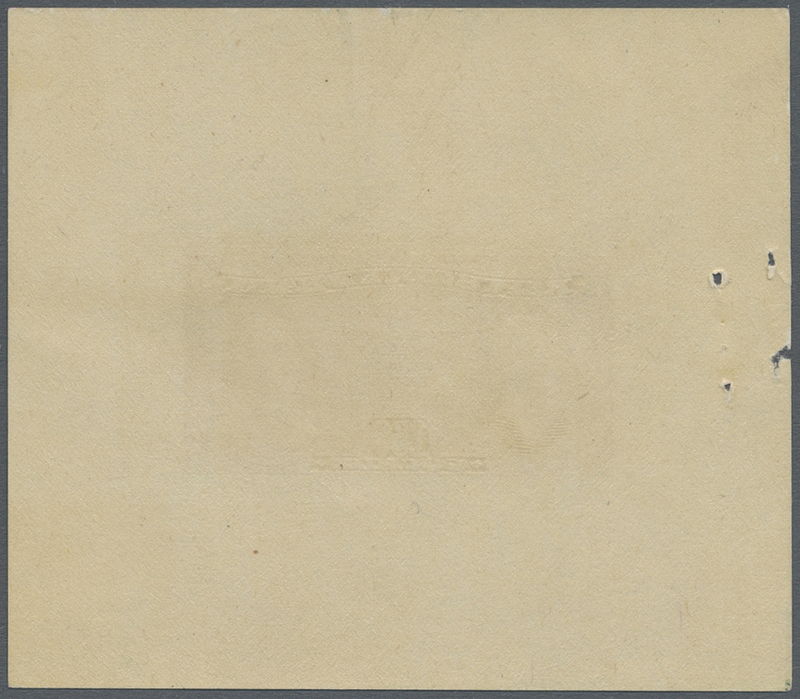 Hinge remnants on reverse. Rarity from archive!